Magnetic resonance (MR) imaging of the pancreas has undergone a major change since the introduction of secretin administration. It has been shown that the intravenous administration of secretin improves the delineation of the pancreatic ducts, allows monitoring of the pancreatic duct flow dynamics and evaluation of the pancreatic exocrine function [1, 2, 3, 4]. 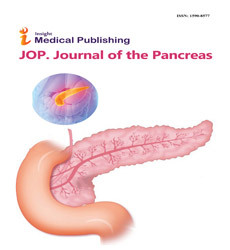 A progressive enhancement of the pancreatic parenchyma may be observed in response to secretin stimulation on dynamic MR pancreatography and has been reported as an insensitive but specific sign of early chronic pancreatitis . We report a case of biologically acute pancreatitis observed 24 hours after therapeutic endoscopic retrograde cholangiopancreatography (ERCP) in which this sign was transiently detected at dynamic MR pancreatography and disappeared after the acute episode. A 65-year-old man with a history of acute pancreatitis (2-3 attacks/year) since 1998, was referred for MR evaluation of the pancreas. At the time of his first MR evaluation, both physical examination and blood chemistry were normal. MR imaging was performed with a clinical 1,5T scanner (Gyroscan Intera, Philips Medical Systems, Best, the Netherlands) equipped with a synergy body coil. MR pancreatography projections were obtained using a breath hold single shot turbo spin-echo (TSE) T2-weighted sequence (~/1050: repetition time, msec/effective echo time, msec; echo train length: 276; section: 50 mm; matrix: 190x512; acquisition time: 3 sec). The projections were oriented in a coronal oblique plane and include the entire pancreatic duct, the common bile duct and the duodenum. After obtaining the optimal MR pancreatogram, secretin (Secrelux®, Goldham, Germany; 1 CU/kg) was injected and MR pancreatography was repeated every 30 sec for 10 minutes. Dynamic MR pancreatography disclosed a dilatation of the ventral duct and a few dilated side branches at the level of the body of the gland that were interpreted as minimal changes of chronic pancreatitis. Duodenal filling with pancreatic fluid produced after secretin stimulation was normal (Figure 1a). Changes resulting from mild chronic pancreatitis were observed one week later at ERCP and endoscopic sphincterotomy of the major papilla was performed. The day after, an increase in serum amylase and lipase levels (4 times the normal value) was observed but the patient remained asymptomatic. A new dynamic MR pancreatography was performed before discharge. Progressive and diffuse enhancement on each side of a dilated main pancreatic duct (Figure 1b) was observed together with a reduction in duodenal filling. The patient had no pain during the procedure. One month later, a restitution of pancreatic flow dynamics and duodenal filling was observed at control dynamic secretinenhanced MR pancreatography (Figure 1c). Figure 1. 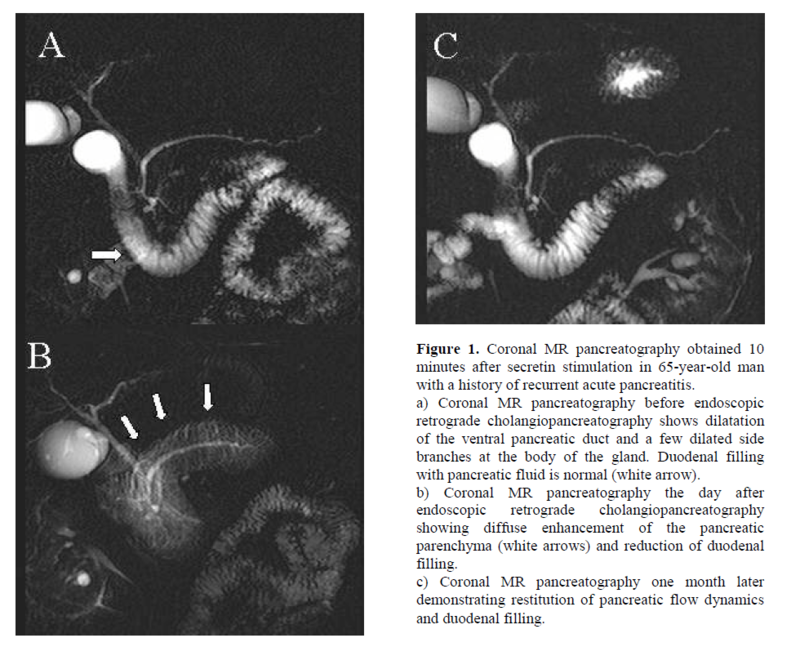 Coronal MR pancreatography obtained 10 minutes after secretin stimulation in 65-year-old man with a history of recurrent acute pancreatitis. a) Coronal MR pancreatography before endoscopic retrograde cholangiopancreatography shows dilatation of the ventral pancreatic duct and a few dilated side branches at the body of the gland. Duodenal filling with pancreatic fluid is normal (white arrow). b) Coronal MR pancreatography the day after endoscopic retrograde cholangiopancreatography showing diffuse enhancement of the pancreatic parenchyma (white arrows) and reduction of duodenal filling. c) Coronal MR pancreatography one month later demonstrating restitution of pancreatic flow dynamics and duodenal filling. Progressive hydrographic enhancement of the pancreatic parenchyma has previously been described and called acinar filling in response to secretin stimulation when MR pancreatograms were obtained . It has been speculated that this sign might illustrate ductal and tissue hypertension that have been described in humans  and in animal models in the early stages of chronic pancreatitis . In the present report, precise knowledge of the events (change in enzyme levels in association with the therapeutic procedure) allows us to correlate the occurrence of the progressive hydrographic enhancement of the pancreatic parenchyma in response to secretin stimulation with a minor complication (hyperhydrolasemia) of endoscopic sphincterotomy. Post-ERCP hyperhydrolasemia may be encountered in up to 70% of the cases and is a condition that has been described as more frequent in patients undergoing pancreatic sphincterotomy and in those with acinarization during the ERCP procedure . Whatever the cause of the pancreatitis, the initial event is the premature intracellular activation of proteolytic enzymes resulting in cell injury and autodigestive process. In our case, this initial event was linked to the occurrence of hydrographic enhancement of the pancreatic parenchyma after secretin stimulation at MR pancreatography and, therefore, such enhancement may represent fluid leakage caused by an increase in ductal and tissue pressure. Interestingly, hydrographic enhancement of the pancreatic parenchyma at MR pancreatography was reversible and associated with transient reduction of duodenal filling after secretin stimulation. This association is of particular interest and could illustrate the increase of interacinar permeability, the disturbances of exocrine secretion and/or outflow obstruction occurring during pancreatic injury.